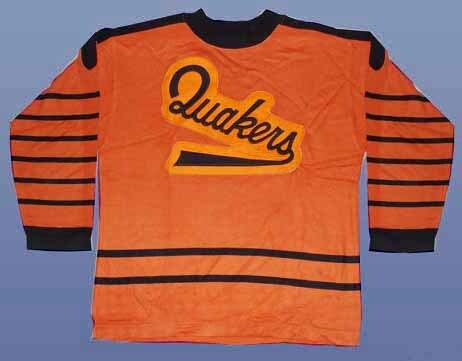 The Pirates, the third American-based NHL team, got off to a promising start in 1925 – 1926, making the playoffs in two of their first three seasons. However, the team soon fell on hard times both on the ice and at the box office. A sale to bootlegger Bill Dwyer did not help the cause. With the stock market crash of 1929 followed by the Great Depression, the owners found themselves having to sell off their star players to make ends meet. By the end of the 1929 – 1930 season, the team was $400,000 in debt, and their arena, the Duquesne Gardens, was not suitable for an NHL team. Boxing promoter Benny Leonard, Dwyer’s front man, then requested permission to temporarily move to Philadelphia as the Quakers (from the historical importance of the Quaker religious community in the founding of Philadelphia and Pennsylvania) until a new arena was built in Pittsburgh.